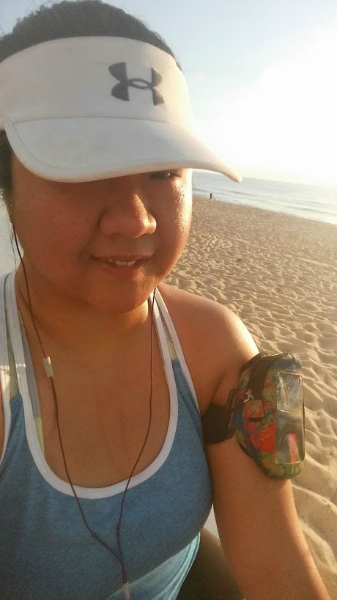 Yesterday morning my alarm went off at 6am and I headed down to the beach for a sunrise run. These used to be so typical for me, but I haven’t done one in a while. Since the beginning of the year I had been either starting my runs later (because the weather was cooler) or I had run on the treadmill. Well, the weather is no longer cooler and I suspect that the treadmill has something to do with my hip tightness. I obviously can’t prove that, but the hip tightness started up right around the time I began running on the treadmill more often. Aside from the occasional hill workout, I won’t be doing anymore treadmill running for a while! ^ I love when the sky looks like cotton candy. It’s so pretty. Not so pretty was the 88% humidity. I felt like I was running through a sauna and was glad that I was only doing three miles and not a long run. My hip felt a little tight immediately after the run but I stretched really good and it loosened up quickly! Ohh and guess what? I recently applied for a Fort Lauderdale resident beach parking pass. I have no idea why it’s taken me this long! I enjoy running down to the beach, but the downside to that is you don’t really get to enjoy the beach when you’re done. You run down to it and then you run home. The advantage of driving to the beach is that when you’re done you can stick around, stretch and lounge on the sand before going home! I’ll probably alternate which days I drive there and which days I run there, but I really like having the option! I’m hoping this week I’ll be able to get back onto a normal running schedule. I’ve been missing it! Best part of your weekend? Get in some good miles? Next Post Hey! Let’s Catch Up! 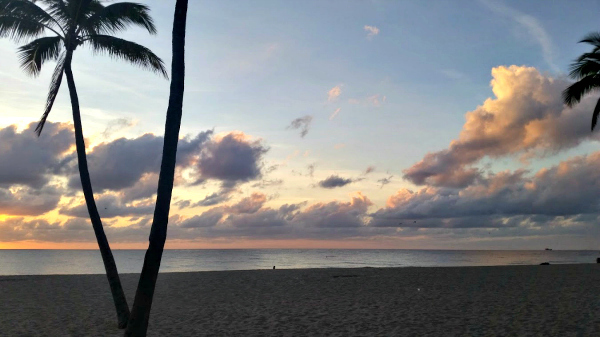 I love seeing the sun rise when I run, and I especially like it when running on the beach (which only happens like once a year for me)! Glad the hip is improving- I think I change my form a bit on the treadmill. My PT pointed it out last week so I have been working on it and when I do run on a treadmill I run in front of the mirror to watch my form. Your pictures are so pretty! I am so jealous of the views you get to take in while running , but you can keep that humidity part! I have found that treadmill running slightly changes my form and always leads to tightness/issues (usually calves for me). I haven’t been able to pinpoint what changes on the treadmill, but something must be wrong. I haven’t run on a treadmill in over a year because I know it is not worth the resulting injuries. Beautiful pictures! You need to send some of that warmth up here to the midwest! I’m glad to hear that your hip is feeling a bit better. Best part of my weekend was finishing a 13-mile race simulation run. It was nice and cool and my husband biked along next to me, so I had good company. Ever since I stopped running on the treadmill my hip has gotten progressively better. I have no idea if that’s a fluke or the treadmill really did have something to do with it, but I’m going to steer clear for a little while anyway. Great job on the 13 miles! I’m jealous! It’s been too long now since I’ve knocked out a double digit run. I always love your beach pictures! But i can feel the humidity lol it’s really no laughing matter. SO glad the hip loosened up quick- progress, right?! I ran too speedy Saturday and I am still sore. I have no self control. Yes, pretty quick progress! I feel really lucky to be bouncing back so fast as I know many people experience on-going nagging hip issues. Fingers crossed that everything keeps getting better. Love these photos, and glad your hip is doing better! You know, it’s funny, my hip issue only came up after my second treadmill long run in a row (10 miles on one Saturday, then 11 miles the day my hip started hurting). Makes me wonder! Dumb treadmill! We need to boycott it! I am totally jealous of the warmth–but not the humidity. I would say that 75% of my yard still has some snow–but it is melting!! I am SO ready for spring! When I think of running at the beach, I think of standing in the water post-run and “icing” my legs–I guess the water is a lot warmer there! I think you’re onto something with the forced constant pace/stride! Haha yeah, I wouldn’t be icing my legs in the water. That sounds really nice though! I actually never go in the water. I hate the feeling of the ocean floor on my feet! 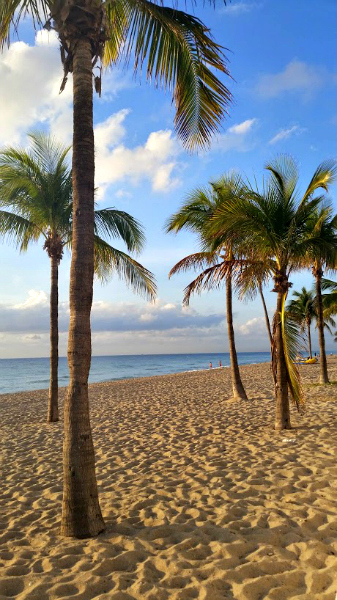 Our beaches don’t have pretty palm trees! Why is that? I’m super glad I don’t have to run in extreme humidity or cold for that matter. At the same time, when I run anywhere but SoCal I’m never prepared for any elevation or weather changes. That’s great news about your hip!! You are lucky to not have to deal with the humidity. I need to move to your coast! After many years of running only on a treadmill while I watched recorded episodes of Oprah, we finally broke up about 2 summers ago. My gait changes so much when I am on it and my PT and I decided I either run outside or run on an indoor track! I actually ended up selling my treadmill to my PT! But he won’t make me get on it when he is doing a form analysis–he lets me go outside and watches me. I wish I had an indoor track nearby. I would LOVE to run on one. I haven’t run on any type of track since high school! I’m with you – I would definitely want to maximize the time spent enjoying the beach – that parking pass sounds like a great idea. I hope that running outside more keeps your hip from being so tight. That last picture… you live in paradise! Do you ever get in the ocean after you run now that you drive there? This past summer I ran at a state park in DE that had a beach. Paul played disc golf while I was running and I was done before him, so I got in the water afterwards. It was freezing but felt SO GOOD on my muscles. NOPE! I never ever ever ever get into the water. I have always hated the way the ocean floor feels on my feet. When I was a kid I would wear those water shoes but as an adult I just skip it altogether. I know I say it all the time, but I wish my beach had a sidewalk/boardwalk like yours! This color sky always reminds me of Trix yogurt! Especially when the colors are a little brighter, it always reminds me of that funky colored, super sweet yogurt. Oh, yes, I am so with you! I love bringing a book down to the beach and laying under a palm tree for hours. I usually do it during the winter though. During the summer months it’s too crowded! Beautiful pictures! 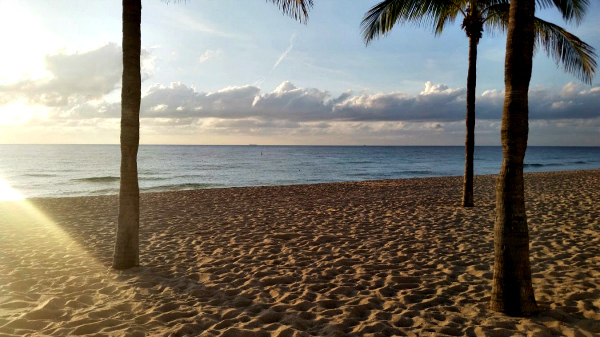 Do you actually run on the beach–in the sand? Or on a boardwalk? I would think running in the sand would be a little tougher. Either way, it’s beautiful! Running on the sand is 1000000 times harder! I always run on the sidewalk. Well, that’s not true, I’ve run on the sand for VERY SHORT periods of time before. It’s a total killer on your calves! 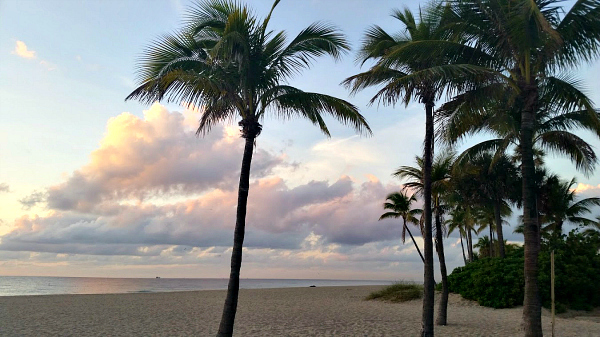 I love running when I go on vacation because that’s the only time I get to run on the beach! I love how flat it is and the scenery is so distracting so I can just forget that I’m running. Take it easy on that hip! Beautiful! They certainly do look like cotton candy. Parking is ridiculous. If I run in Georgetown/decide to drive, I’ll try to go on Sunday when the meters are not in effect. I love a nice cotton candy sky! The weather here in NC hasn’t warmed up too much yet (it’s been in the low 60s) but I’m dreading the humidity that we experience in the summer. Seeing this post reminded me of that! Those pictures are absolutely amazing! Good luck on getting back to a normal running schedule!